Each presentation includes a quick sketch of what the site entrance could look like with the Healthy Land Use Model. This sketch is for Zanker Recycling. The Healthy Land Use Model is a landscape model for corporate sites that develops healthy, innovative, and sustainable landscapes. CNGF is building community support for this model. CNGF suggests that corporations in Silicon Valley convert their lawns and non-native landscapes, because Silicon Valley is a worldwide leader in innovation and sustainability. Corporate landscapes should reflect leadership. Our Healthy Land Use presentation provides ideas for using this land to best benefit your company, the community, and the environment. Incorporate the Sustainable Sites Initiative http://www.sustainablesites.org/, a landscape rating system that the U.S. Green Building Council anticipates will be incorporated into the next iteration of LEED. 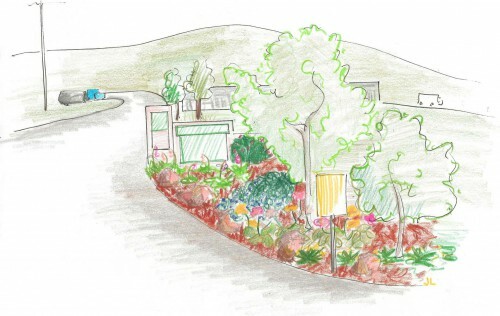 Connect with the Sustainable Landscape Alliance (SLA), a team of sustainable design, construction, and maintenance companies comprised of Middlebrook Gardens, Cagwin and Dorward, and Earthcare Landscaping. The SLA can design, construct, and maintain your site. Provide on-site and local community service opportunities. Improve ratings such as carbon-footprint, water consumption, and social sustainability. Support healthy kids through a school garden partnership. Promote a healthy work environment for your employees. Promote a healthy, ecologically-functioning environment for the future. If you are interested in finding out more, please contact us for a 20 minute presentation.